Skinboat Journal: What is possible, contd. On our last day in Sand Point, we found some dry suits airing out on the railing of the motel we were staying at, the Anchor Inn. 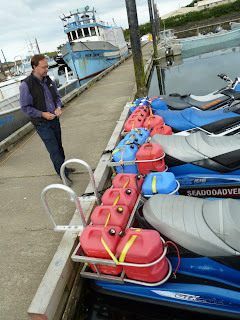 At first we thought they belonged to some kayakers, but in talking to the owners of the dry suits, we discovered that they belonged to some jet skiers who were using jet skis to travel from Seattle to Nome. The trip is apparently being financed by a cable TV network which will air a show on the trip sometime in 2012. Partial video below. 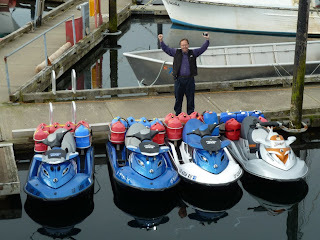 After talking to the jet skiers we went down to the harbor to look at their rigs. 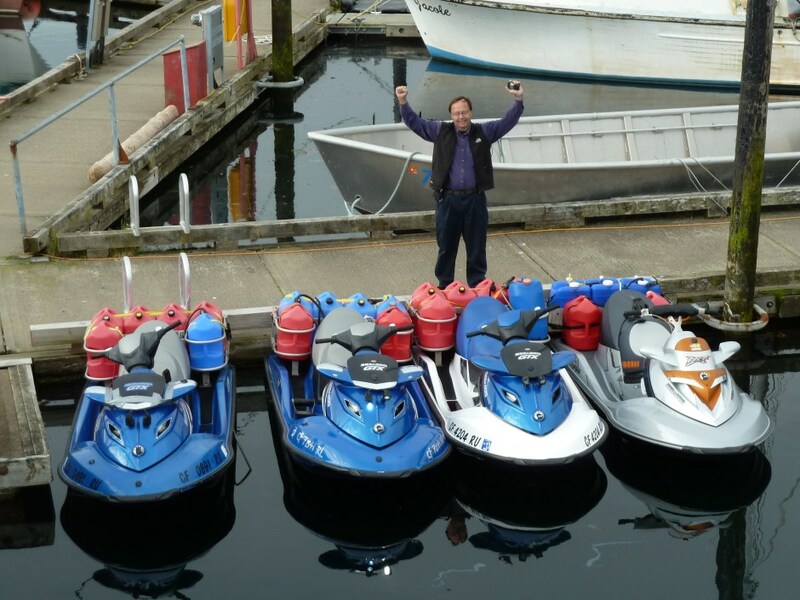 Here's the jet skis and Mike Livingston for scale. Due to the general unavailability of gasoline en route, each ski had six extra 5 gallon tanks. After Sand Point, these guys were headed for King Cove and after that to False Pass where they would cross from the Pacific into the Bering Sea. 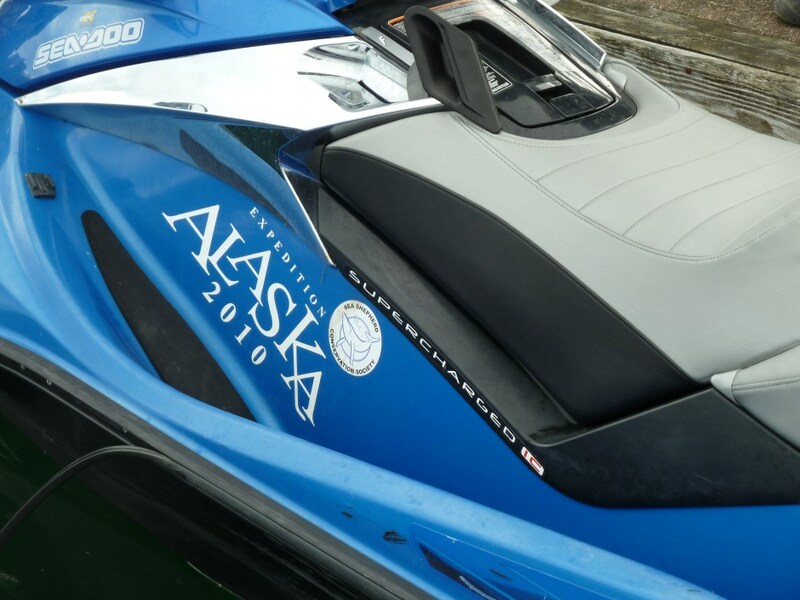 So OK, it's a stunt of sorts to travel from Seattle to Nome by jet ski. For one thing, there aren't enough places to get gas. At one point, these guys had to get gas flown in to them, but other than that, doing the trip by jet ski isn't much different than traveling somewhere by motorcycle. So does this mean that we will now start seeing jet skis being used for long trips along our coasts, or to cross to Hawaii from LA? Who knows. It is possible no doubt long as you can get someone to bring them gas. You should tell everyone that you had to hitch a ride on the deck of a Bering Sea crab boat from False Pass Ak to Port Moller Ak. 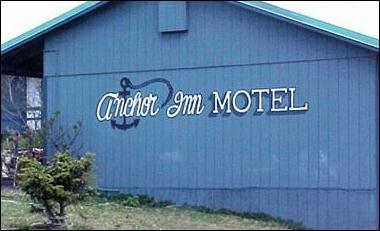 About 100 miles you didn't dive your water craft.